. Kyoto Clay Dolls　京都土人形　. Fushimi is now a suburb of Kyoto. The famous Fushimi Inari Shrine 伏見稲荷is located there. This story takes us back to the Momoyama period to Southern Kyoto (Rakunan 落南), where the warlord Toyotomi Hideyoshi had build his famous Fushimi Castle to spend his old age there. The castle was later destroyed, but the Great Shrine of Fushimi retains its presence in the area. Let us look at the shrine first to get an impression. The "Great Fox Shrine" at Fushimi (伏見稲荷大社) was founded in the 8th century. The Fox cult, with over 40,000 shrines across Japan, has become associated with financial success, and the hillside behind the shrine is lined with thousands of vermilion Torii gates and figures of foxes donated by business people and devotees. The shrine is famous for these myriad Torii, large vermilion lacquered post and lintel structures. They wind their way through the hills of Inari Mountain, forming a hallway through which the surrounding forests may be glimpsed. The five shrine buildings in the precincts are actually devoted to five deities of the Shinto religion, including the Godess of Rice and Food and her messenger, the FOX, called Inari 稲荷. The central structure, beautifully roofed with cypress bark, dates from 1949, but its architectural style is characteristic of the late Muromachi period. You can take a walk around the large precincts. The Inari Mountain is really huge and you can easily get lost in the woods, still wandering under red Torii all the while. Take some time for your hike in this area, it has a wonderful feeling to it and you would not be surprised if a little fox was coming out of the woods to give you some enchanted rice cake and a cup of tea. The origin of all clay dolls in Japan is believed to be the "Fushimi Clay Dolls", painted dolls made of unglazed pottery that were sold in front of the gate to Kyoto's Fushimi Inari Shrine around the 16th century, starting at the end of the Momoyama period. 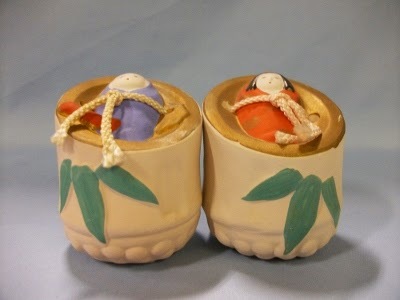 They are also called called Fukakusa Dolls or Inari Dolls. There are some theories about who started to make them. Some say it was Sachiemon, the doll maker in Fukakusa, who started doll-making after the Sekigahara War. Others say it was Fusajiroo Tsujii or Gonbei, a salt maker. Or the producers of roof tiles for Fushimi Castle turned to doll making after the castle was finished. There are still many roof tile makers in the area of Fukakusa. There are various types of dolls: some are painted in brilliant colors, others are finished in lighter colors to allow the character of the clay to show through, and still others are finished by glost-firing or twice-firing. The many different varieties include traditional dolls that reflect the court customs of ancient Japan, new style dolls that capture the joyful expressions of small children, dolls that celebrate seasonal festivals, animals that represent the years of the Chinese calendar, and earthenware bells. Today clay dolls are made in about 300 locations all over Japan, but all find their ancestors in Fushimi. There used to be about 20 kilns around Fushimi to produce these dolls but nowadays there are only two shops that make and sell these dolls along with other dolls and Shrine paraphanalia along the access road to the great Fushimi Shrine, the Tanka and the Hishiya shop 丹嘉と菱家, but only the Tanka shop has its old roots in the Fushimi area. produce these famous dolls and they still have more than 2000 different forms. The shop of the Hishiya family used to be right behind the Tanka shop,but they have moved on to a suburb of Uji City; the late Mr. Heijiroo Ueda and his daughter Masako（上田平次郎と昌子）produce the dolls. 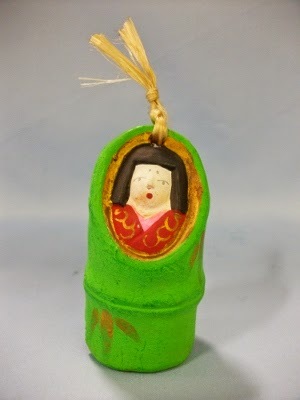 But Mrs. Masako Ueda is getting old and produces only a few nowadays, sold at some local stores at the entrance to the Fushimi Shrine.
. Fushimi no dorei 伏見の土鈴 clay bell from Fushimi . is said to be the oldest clay figurines in Japan. These clay dolls were taken home as souvenirs by people who came from all over Japan to visit the Fushimi Inari Grand Shrine. 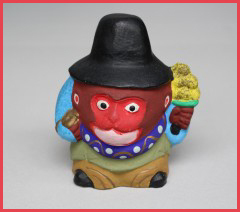 Each region in Japan has its own style and history when it comes to clay figurines. At the end of the Edo Period there were over 60 kilns producing these figures in Fushimi, but now there is only one left – Tanka – which has been making Fushimi Ningyo for 260 years from its location right in front of the main gate of the Fushimi Inari Grand Shrine. There are said to be around 2,000 different designs of these ancient clay figurines. They are also known as Inari or Fukakusa Ningyo. choorooken, chooroo ken, chooroomai 長老舞 "dance of the old men"
A street performance in Kyoto and Osaka, where persons clad in special robes walked around the streets, singing and dancing at the gate (門付け芸) to wish luck for the New Year. They wore special papermachee masks on their head, like 福禄寿 Fukurokuju, one of the seven gods of good luck. Accompanied by Shamisen and drums they were a lively scene. Some dolls now have the form of a monkey or horse or Tokusuke　徳助.
. Otafuku, O-Tafuku, O-Fuku お多福、お福 O-Kame San . is one of the eleven wards in the city of Kyoto, in Kyoto Prefecture, Japan. Famous places in Fushimi include the Fushimi Inari Shrine, with thousands of torii lining the paths up and down a mountain; Fushimi Castle, originally built by Toyotomi Hideyoshi, with its rebuilt towers and gold-lined tea-room; and the Teradaya, an inn at which Sakamoto Ryōma was attacked and injured about a year before his assassination. Also of note is the Gokōgu shrine, which houses a stone used in the construction of Fushimi Castle. The water in the shrine is particularly famous and it is recorded as one of Japan's 100 best clear water spots.
. hana no miyako 花の都 - Kyoto 京都　. 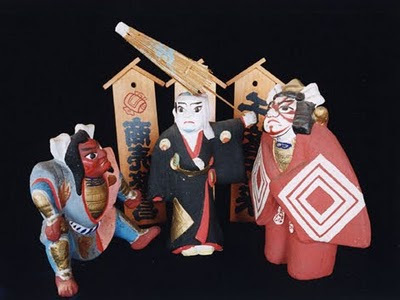 A man named Ikaruga Koo'emon resided in Fukakusa sometime after the Battle of Sekigahara, and it is said that he was the first to make these kinds of dolls. Therefore, dolls that have antique characteristics and the occasional doll with an inscription dating it to the Eiroku era (1558-1569) are often attributed to Koo'emon of Fushimi. I once heard the following story from my elders. When people who purchase a Fushimi doll on the First Day of the Horse meet with bad luck, they should break the doll at a riverbed. 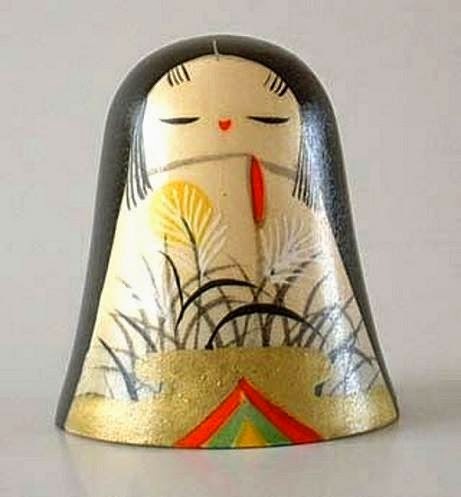 If they do not meet with bad luck, they begin to collect dolls one by one each year. Once they have collected seven figures, they dedicate them to an Inari Shrine in appreciation of the seven years of uneventful peace. Then, they start purchasing dolls all over again.
. 長楽寺 Choraku-Ji in Kyoto . 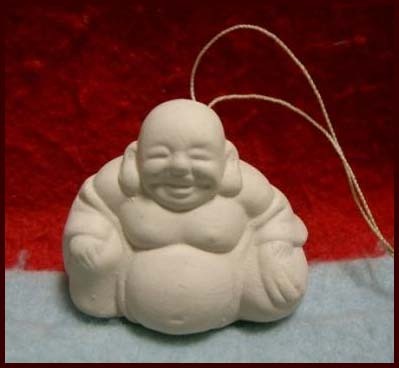 If people built a new home, they buy a clay figure of 布袋 Hotei on the first day of the horse and venerate it on the Shelf of the Gods (kamidana 神棚). The following year they buy a statue just a little bit bigger and so on for 7 years or 12 years. If something unpleasant or a disaster happens during this time, they throw all the statues in a river or bring them back to the Shrine and begin again with the smallest statue.
. hatsu uma, hatsu-uma 初午 (はつうま) First Day of the Horse . Once a child was asked whom it liked more, his father or his mother. The clever child took a round rice cake, parted it in two and showed it to the person questioning him: "Which rice cake tasts better?" the child asked. So with respect to this story these Fushimi dolls are bought with the wish that one's own child would grow up as clever as the child in our story. dog warding off the three worms . Now we come to an interesting clay figure of my collection. Here is a priest in an orange robe on a tiger, which I bought as a Daruma, but as I learned from this HP, it may be not Daruma but Bukan. 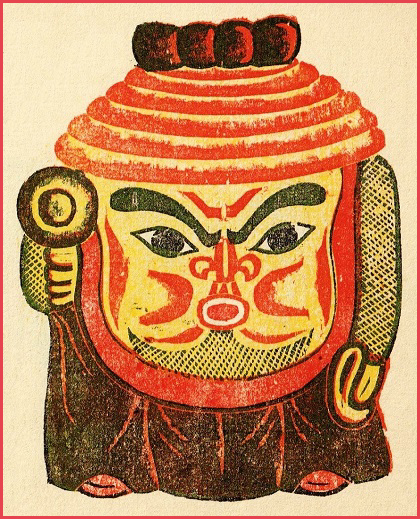 Another book about antiques shows this doll as a "Daruma riding a Tiger". So let us look at who was Bukan, before we decide. 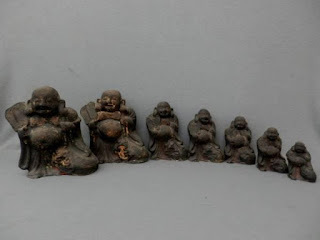 Bukan's name in Chinese is Feng-Kan and this Zen eccentric is maybe best known from the picture of the "Four Sleepers", Feng-Kan leaning on his tiger together with Han-shan and Shih-Te (Kanzan, Jittoku in Japanese). This picture is generally interpreted as symbolizing the absolute tranquillity of the universe for those who have attained Enlightenment. Bukan being in full controll of the tiger also signifies a human being in full control of its passions and emotions. Have a look at this famous Zen picture right here. Since Bukan liked to ride his tiger around the monastery to shock other simpler folks, I guess the doll is indeed Bukan and not Daruma. But whoever he is, it's a beautifully made piece of folk art and a great item of my collection. The face of the tiger is just unique. There was also a tradition of papermachee dolls in Fushimi, starting in the Meiji period and lasting for three generations. 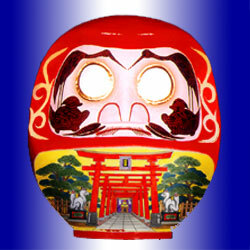 They were quite unique dolls and many different Daruma figures were produced, for example Daruma with a headband in many different sizes, Daruma streaching out his tounge, Daruma yawning, Daruma as a fox or a soldier and others. Unfortunately I do not have any pictures of these Daruma but if YOU have any, please share them with us.
. "hug basket" dakikago 抱籠 . lit. doors (or rather pivot door hinges) of Fushimi, windows of Yodo. The original does not use and verbs, it is a good sample of haiku as the "poetry of nouns". 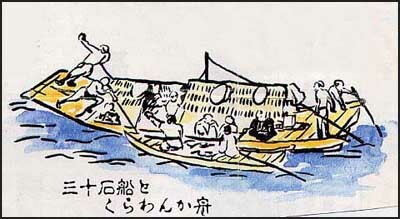 Buson had been taking the first boat down the river Yodogawa, starting in Fushimi. Here the doors are still closed, but as his trip proceeds, the windows begin to open and another busy day is about to start. Fushimi was the starting point of sanjikkokubune 三十石船 "150-bushel rice boats", special boats to transport goods and people from Kyobashi in Fushimi down the river toward Hachikenya 八軒屋 in central Osaka, a trip of about 5.5 kilometers. On both banks of the river Yodogawa where the houses of merchants. kurawankabune くらわんか舟 where small boats which sold food like mochi rice cakes, burdock soup and even sake rice wine to the travellers of the bigger boats. kurawanka is a local dialect, meaning " Why don't you eat something ?" The Yodo River is a major river running through the Kinki region, and since ancient times it has been the main artery connecting Kyoto and Osaka. A number of towns, such as Kawajiri, Kanzaki, Kanijima, and Eguchi, developed at the mouth of the river, with Eguchi in particular becoming quite prosperous. OE Masafusa described Eguchi as "the most pleasurable place in the world" in his book titled Yujoki. 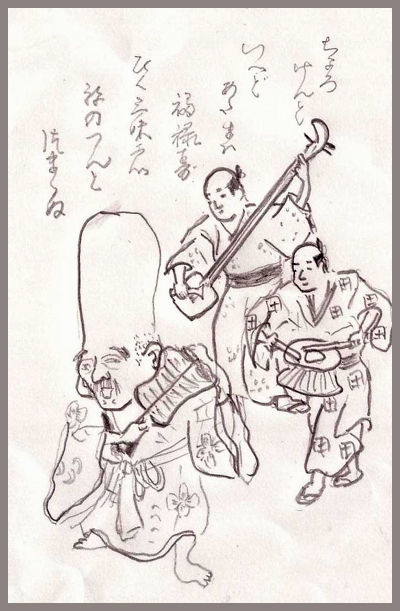 This well-known tale of Eguchi-no-kimi ("Princess from Eguchi") long passed down from generation to generation features a conversation made up of questions and answers between a priest named Saigyo and a harlot. Similarly, Eguchi, the Noh drama written by Kan'ami, features a conversation of questions and answers conducted between an itinerant priest and Eguchi-no-kimi, a harlot. The painter MARUYAMA Okyo often used the Yodo River as his subject, while the poet YOSA no Buson expressed his love of the river in richly evocative sung haiku.
. Buson and 江口のはしもと Eguchi no Hashimoto . HASHIMOTO . . . many boats passed the river Yodogawa, where famous courtesans waited for customers on the left bank . . .
. hara ashiki soo mo mochi ku e Joonanjin . Buson visiting Joonanguu 城南宮　Jonan-Gu, Jonangu Shrine in Fushimi. 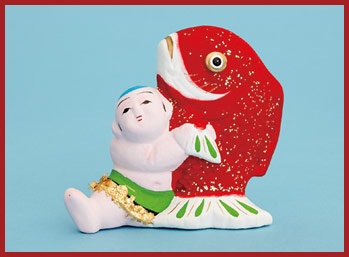 Fushimi Doll is a clay doll whose originator is said to be Hajibe who settled in Fukakusa before the Nara era. 土師部　Hajibe is a tribe who was notable for their skills in making Haniwa (a clay image placed in ancient burial mounds) and earthenware. The doll was made of clay from Mt. Inari, and was distributed widely, not only in old capital provinces but to Shikoku and Kyushu. The doll became the precursor of clay dolls that number approximately 90 types nationwide, such as Hakata Doll, Tsutsumi Doll of Sendai and Nakano Doll of Shinshu. Kaguya-hime was a fairy child, found in a shining banboo tree by a wood-cutter and she grew up to be a maiden of rare beauty. Her wooing, the tasks set the numerous suitors who sought her hand, and her eventual return unwed, to the Court of the Moon forms the subject of the earliest Japanese romance now extant, 'The Woodcutter's Tale'. 'Fukakusa', pronounced almost 'Fukak'sa' and meaning literally 'deep grass' is also a place-name and was used by a famous seventeenth-century doll-maker, Kamo Kouemon, to mark the figures he made from unglazed Fushimi-ware. 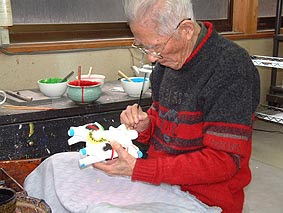 Ikaruga Koo'emon 鵤幸右衛門(いかるがこうえもん) was a famous potter of these dolls in Fukakusa. He was also called "the Dollmaker Koemon", Ningyoya Koo'emon人形屋幸右衛門. His family is still in the business, here is the 6th generation master Tanka 丹嘉 in 2001. Once upon a time, there lived a kind old man and his wife in a village. One day, when the old man went to the bamboo forest, he found a shining bamboo. Upon cutting it, he found inside a baby girl. The old man and woman decided to bring her up because they had no children. They named the baby "Kaguyahime." Whenever he went to cut bamboo after that, the old man found money in the bamboo. They became rich. Kaguyahime grew steadily and became a beautiful lady. She had a lot of young men who wanted to marry her. But she didn't show interest. She always looked up at the night sky. Her father asked her, "What makes you so sad? What's the matter?" She said, "I'm all right. But, to tell the truth, I was born on the moon. I must return to the moon on the night of the 15th of November when angels will come to meet me." "That's nonsense," said the father, very embarrassed and angry. The next day was the 15th. The father hoped she would never return to the moon. On that day, the moon was appearing over the mountain, when a gold light flashed. An angel came down. Kaguyahime couldn't help following the light. She slowly flew up into the sky hand in hand with the angel. Nothing could stop them. The old man and his wife could do nothing but watch her departure. clay bells with motives of legends . The town of Fuji at the foot of Mount Fuji is using Kaguyahime as a tourist attraction. The story goes that her prince came after her and they lived happily in a stone cave in the mountain, which is named FUJI 不死 Mountain where you do not die. 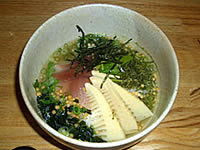 Many restaurants in Fuji town serve their own version. One has a mountain of rice colored pink with some umeboshi pickled plums, to show the morning light of Mount Fuji, and some shirasu small white fish to show the snow on the top. Behind the mountain are three pieces of bamboo shoots as tempura. In some places the waitress wears a costume of Kaguyahime.
. Kawara ningyo 瓦人形 tile dolls .
. Clay Dolls from Japan - Introduction .
. 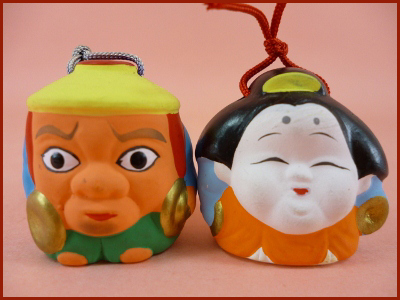 Regional Folk Toys from Japan - Kyoto . oboko is a name for a child, used in many prefectures of Tohoku. "Kintaro, wrestling with a bear....."
A strong boy, Kintaro could throw down a bear in "Sumo" wrestling. He was a chubby red skin boy and always carried a hatchet. The boat looks almost like a Kitamaebune 北前船 North-bound trade ship.